Things Unseen editor Kristine Pommert reflects on working in a deeply unfashionable yet fascinating programme area. Religious broadcasting is not known as a road to fame and fortune. Many of us beaver away year after year, away from the limelight, sometimes viewed disparagingly by journalist colleagues from areas like news or sport. We have chosen our jobs not because we cannot find anything better, but because we find the subject matter endlessly fascinating – and the people of faith who cross our path in our daily work far more interesting than off-the-peg celebrities. But let’s admit it: it’s nice to be rewarded sometimes. So we were unashamedly happy when in October, we came away from a glittering award ceremony at Bafta with not one, but two Jerusalem Awards. The first, in the Digital Audio category, was for our programme on Depression and Faith, which the judges praised as “relevant, wonderful and brave”. The second, in the Good Friday Digital category, went to A Mother’s Good Friday: Diane Foley, which was honoured for being “a fantastic exposition of faith and suffering”. Both editions were presented by Mark Dowd, one of my all-time favourite “partners in crime”. After such conversations, and countless others in the course of a year, I feel truly enriched – and often humbled by the courage and spiritual depth I meet in those we interview. So in that sense, the work itself is its best reward. But needless to say, stepping out onto the stage to receive those Jerusalem Awards is a very special moment in any programme maker’s career. 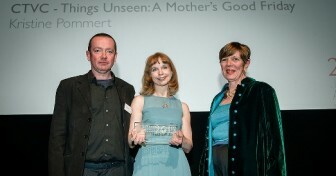 The picture shows Mark and Kristine receiving one of the awards, with Bridget Cass from the Jerusalem Trust. With thanks for the image to Antony Medley. For the record, I’d simply like to add that, producer Kristine Pommert, is also one of my favourite “partners in crime” too! !